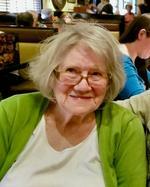 Virginia Elizabeth Schilling, devoted Catholic and beloved mother, 82, of Platte City, MO, passed away on Friday, June 22, 2018. Virginia is survived by her six children; Scott Johnson (and wife Sharon) of Shawnee, KS, Cheryl Brady, Thomas Johnson, and Patricia Fenwick (and husband Garland) of Fredericksburg, VA, Mary Wiedorfer (and husband Joseph) of Washington, DC, and Eugene Johnson (and wife Kaye) of Platte City, MO; her sister Catherine Matthewson (and husband Harry) of Tacoma, WA; fourteen grandchildren, Matthew Brady, Rachel Webb, David Johnson, Sara Johnson, Cara Fenwick, Allison Brady, Michelle Fenwick, Austin Johnson, Emily Johnson, Haley Johnson, Sean Johnson, Shannon Fenwick, Kendall Johnson, and Kaeleen Johnson; and eight great-grandchildren, Malaina Webb, Caleb Webb, David Webb, Mason Webb, Claire Brady, Paige Brady, Robert Borrero IV and Molly Brady. Virginia was born in Queens, NY, on June 20, 1936 and married Harold Johnson of Huntington, NY on June 14, 1958 in East Northport, NY, and spent the past 40 years in the Leavenworth/Platte City and surrounding area. Virginia was an advocate of continuous learning obtaining a Bachelor of Arts degree in English from the College of Mt. St. Vincent’s (1958), a Master’s of Science degree in Education (1976) from Emporia State University and a Master’s of Fine Arts degree from the Kansas City Art Institute (1986). She was a K-12 school teacher specializing in elementary education and multi-cultural educational programs. Virginia was devoted to her faith and attended the Twelve Apostles Catholic Parish. Virginia was a gifted artist with a wonderful sense of humor and wit. Virginia enjoyed her family and friends, gardening, camping and hiking, cooking, sewing, traveling and visiting museums and art galleries. In lieu of flowers, memorial donations are being received by the Twelve Apostles Catholic Parish, 407 Cherry Street, Weston, Missouri, via twelveapostlescatholic.org, and the Olathe Health Hospice House at 15310 Marion Street, Olathe, Kansas, via Olathehealth.org. To send flowers to the family of Virginia Elizabeth Schilling, please visit our Heartfelt Sympathies Store.